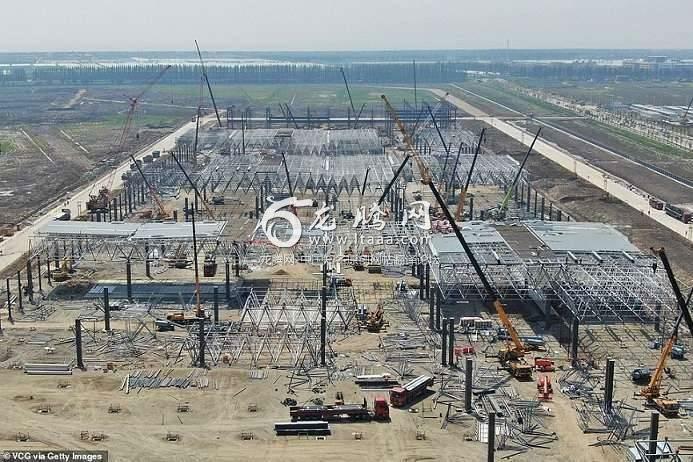 New aerial footage and images have captured the rapid progress being made in the construction of US electric carmaker Tesla's $2billion 'Gigafactory' in China. Construction of the plant has been in full swing since January in Lingang area, a high-end manufacturing park in the southeast harbour of Shanghai. Pile foundation works at the 864,885-square metre lot have been completed and the steel structure construction of the factory has begun, according to officials. Multiple sets of steel roof grids have also been installed. Shanghai city government official Chen Mingbo said in March that the plant's assembly workshop is expected to be completed in May, adding that part of the facility's production line would be put into operation by the end of the year. Last Tuesday, Jerome Guillen, Tesla's President of Automotive, met with Shanghai's deputy mayor, Wu Qing, to discuss construction progress, supply chain logistics and future development plans, according to a statement released by the Shanghai Municipal Commission of Commerce. A construction worker told the Global Times on condition of anonymity that the factory will complete construction in July or August with the current speed. Producing cars locally is also likely to help Tesla minimise the impact of the Sino-US trade war, which has forced the car maker to lower prices of its US-made cars in China - which has becoming increasingly important as the company seeks to offset softening demand in the United States. Trade war aside, the carmaker is building the plant in an auto market that likely contracted last year for the first time in decades. However, sales of so-called new-energy vehicles (NEVs) - a category which includes Tesla's battery-powered cars - continue to be strong in a country where the government aims to shift away entirely from combustion engine vehicles. China is successful because you don't have much red tape if the government decided something then the residents cannot appeal it's decision. I remember once when I went to China they were building a bridge they worked 24 hours a day upon my return 3 months later the bridge was completed and operational. If it was being built here it would take 3 years with Health and safety, people complaining about the noise at nights etc. If you want progress look at the emerging markets. Look how Dubai had changed over last 20 years. We have too many council and councilors stopping progress, going to be left behind at this rate. Well, just crossed Tesla off of my list. Because they can and we can't. Um...so who's going to work there? It's on the Eastern edge of Shanghai on delta land. The rank and file don't have transportation to get to the factory. It's another shell game by Elon Musk. Send money loons. @Doc Yes. But none of them go to the Pudong flats and there's no plans to build one. You obviously don't know how these places work. They will build accommodation for the workers. They will live on site and have everything provided for them. They will also get their two one week holidays provided for them and they all go together. Its just what we did 100 plus years ago in our industrial cities. Its why we have so many old terrace houses, most came with the jobs and then sold off when the companies were no longer profitable. Its all about catching up, but we really need to start pushing advances here like Germany and France. Yes we are a money capitol, but gambling is a losers game. Never trust anything "Made in China". Drugs that cause cancer. Illegal fentenyl, Children's toys with lead paint....the list is endless. @Doc. Next time the Germans want your sunless isle, don't come knocking on a Yank's door for help, okay! 4.9 Billion in U.S. Government subsidies to Tesla, empty auto factories all across the US, and he builds a new factory in China. Typical. It's all about the money, honey. It's cheaper to get it made there. We can thank Obama for those subsidies.